Plastic packaging has come under-fire in recent times with supermarkets and manufacturers under increasing pressure to reduce its usage in order to unlock environmental benefits. The main problem being, generally speaking, the difficulty in recycling some plastics that result in them being sent to landfill, or worse, left on the streets or clogging up the oceans. However, while great strides are being made in developing recyclable materials for packaging, there are also significant sustainability benefits that have been brought about by innovation in the packaging sector that must figure in any discussion on the use of plastics in consumer products. The environmental slogan – ‘Reduce, Reuse, and Recycle’ runs in priority order – environmentally speaking it is more beneficial to reduce, than it is to reuse, and in turn more beneficial to reuse than recycle. 1) One monumental global problem addressed by Doypacks is food waste. around 33% of the world’s food ends up being wasted – Imagine the amount of energy used and the carbon footprint of the processes that produce and transport the wastage. Plastic offers supreme protection against the gases and moisture that degrade the food and result in it being spoiled – thus lengthening product life and reducing food waste. 2) A further benefit of zip-lock Doypacks specifically is that they encourage the consumer to close, and reuse the packaging, rather than simply throwing it away after initial usage – once again lengthening the lifespan of food and reducing waste. 3) Doypack pouches are lightweight and take up minimal space – this reduces the carbon footprint of both the manufacturing process and the transporting of goods. 4) Being lighter in material use also results in a direct reduction in waste product after use. Doypack pouches allow for all marketing and nutritional information to be printed directly onto the packaging, removing the need for labelling processes. As a premium packaging equipment manufacturer, Shemesh Automation is also taking responsibility for reducing the environmental impact of packaging – introducing CITADEL – its complete monoblock packer for Doypacks. 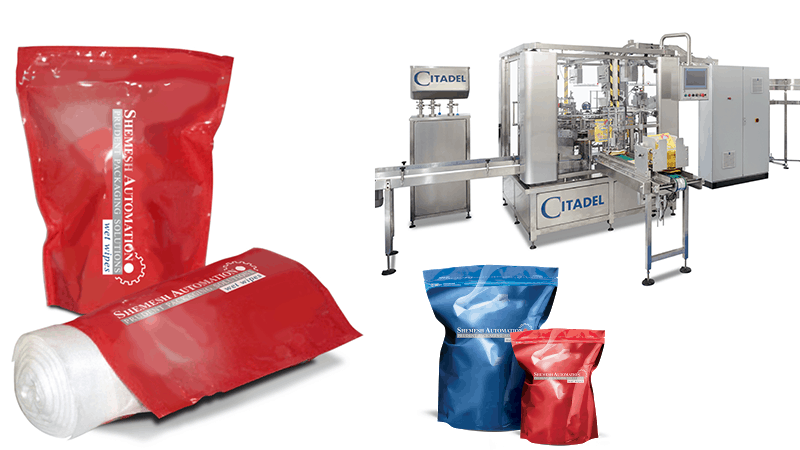 Initially developed for the round wipes market, the Citadel reduces the footprint of the flexible packaging process by bringing all elements of it into one smart compact unit. Measuring no more than 2m x 2m the Citadel automatically feeds, stuffs, fills and seals Doypacks at a speed of up-to 30ppm. The Citadel’s ultra-accurate 2-stage filling system (filling to a tolerance of 0.25%) and complete QC both have a hand in keeping waste to a minimum. Indeed, the environmental benefits were a major factor in Citadel reaching the finals of the i-Novo Technology awards in 2017. Find out more here. In conclusion, from consumers right the way up the supply chain to equipment manufacturers, we all have a responsibility to limit the environmental impact of packaging. From the real progress being made in the development of recyclable plastic, to engineering innovations from manufacturers, it is important to remember some of the positive steps that are being taken in an industry that is constantly evolving and providing innovative solutions to some of the challenges facing us globally.